Recently I was trying to un-install Norton Antivirus 2007 and was facing some issue. So I was looking for an application which will help to uninstall antivirus software. After searching for a while I found AppRemover. AppRemover is a freeware utility which will help you to uninstall security related software like antivirus and antispyware applications. AppRemover will be very useful when the applications built-in uninstall procedure fails or when you are planning to replace your current security application with another one. AppRemover will be very useful for system admins while dealing with multiple security related applications. AppRemover uses very less system resources and has got simple and easy to use controls. AppRemover supports many antivirus and antispyware applications from ALWIL, AVG, Avira, CA, F-Secure, F-Secure, Kaspersky, Lavasoft, McAfee, Panda, Symantec, Trend Micro and many more. 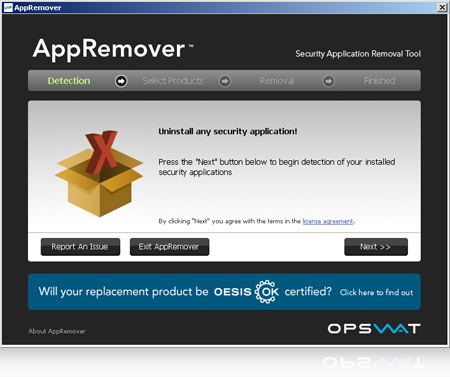 AppRemover works with Windows XP (32 / 64 bit), Windows Vista, Windows 2000, Windows 2003, Windows 2008, Windows 7 beta.